When you first launch the app it will ask you to input your FUT email and FutBotManager subscription number. You can find this number under your My Account section. Once this is completed it will ask you to restart the application. 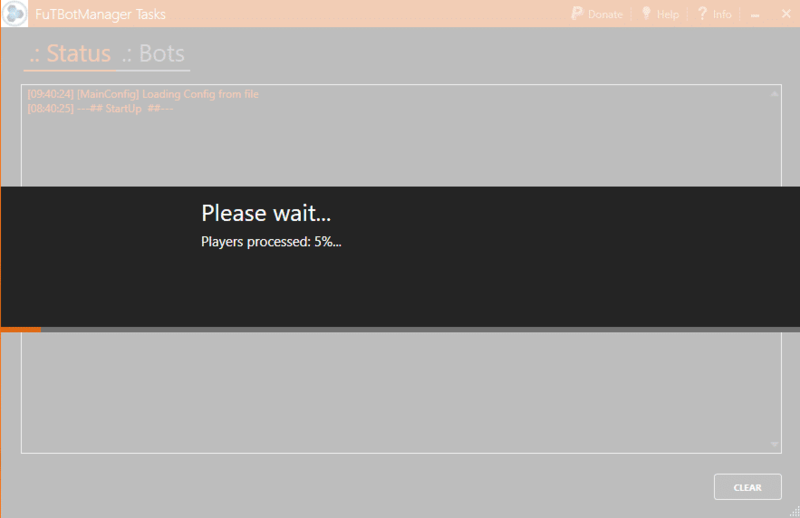 When the program restarts it will need to download the database of players. This can take anywhere from 1 to 30 minutes, depending on your internet speed. When finished this will greatly increase your search ability within the program. If you have any issues getting everything started please contact us and send the error message. 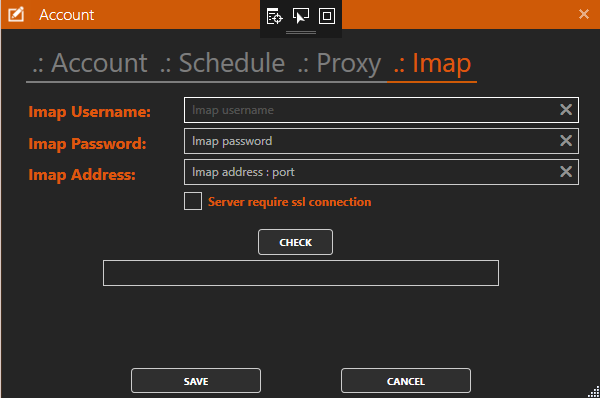 Once you have logged in successfully you will see a screen similar to img I. 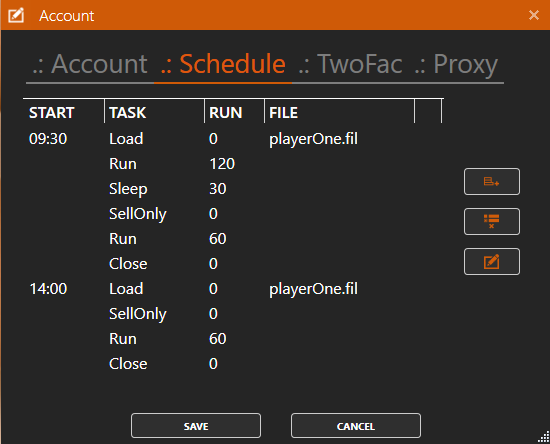 To manually start an account simply click the play icon next to the account information #4 (Instances tab). 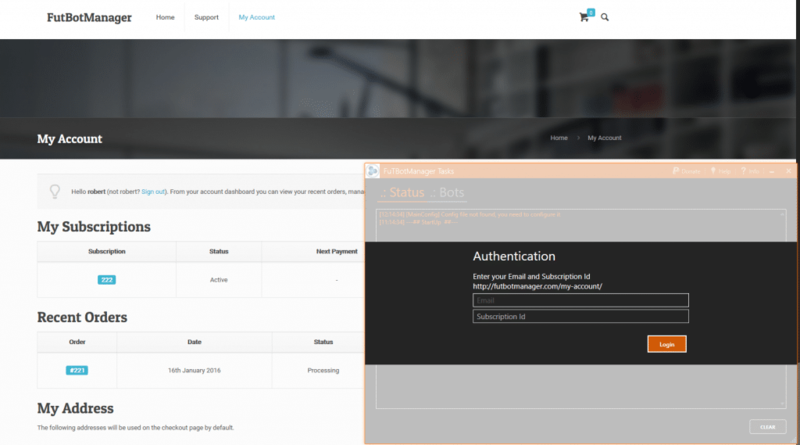 On your first login EA will send a code to the email / phone you registered with the account or you can also use App Authenticator if you enabled it. A new window will open for you to input the code. 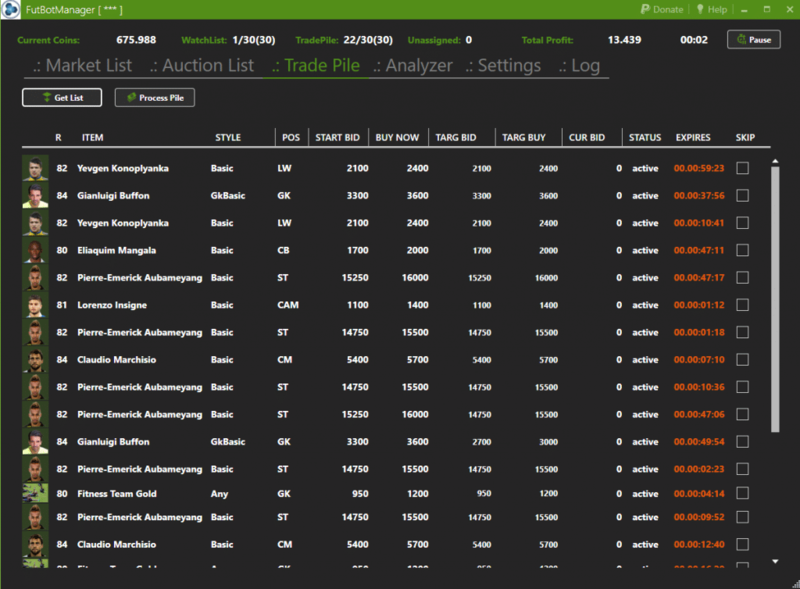 Clicking the ADD button will allow you to select items for the FutBotManager to bid on. This will display a window with all of the items available. 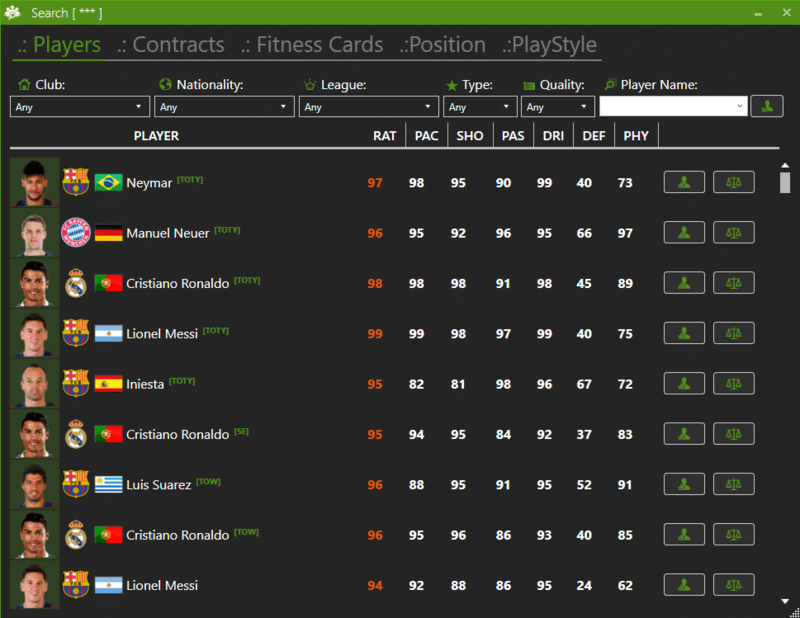 The categories include Players/Contracts/Fitness Cards and others. The selections will vary based on your license. 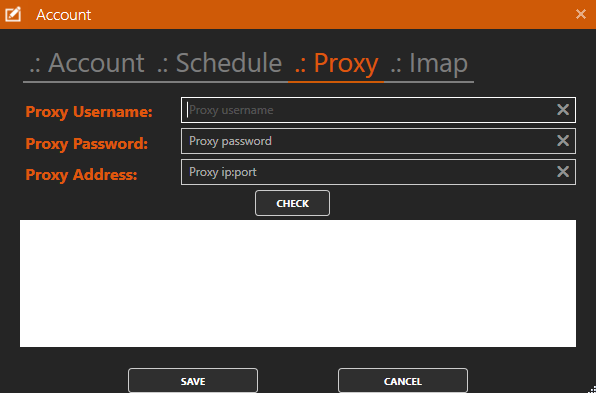 The Features page will go into more detail. If you wish to search for an Inform which has not been updated into the list yet, you can select the Specials button in order to force it. Once you have made these choices you can click the Add button to add it to the Market List. When the item is first added the Skip button will be selected. 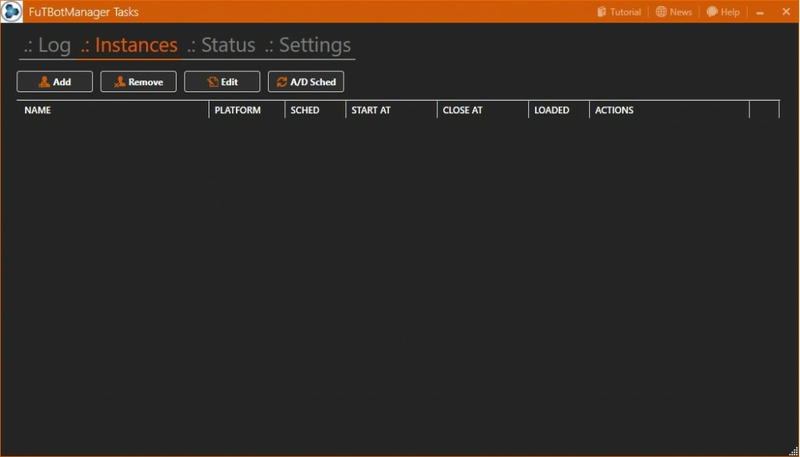 This allows you to verify your settings and ensure there are no mistakes. 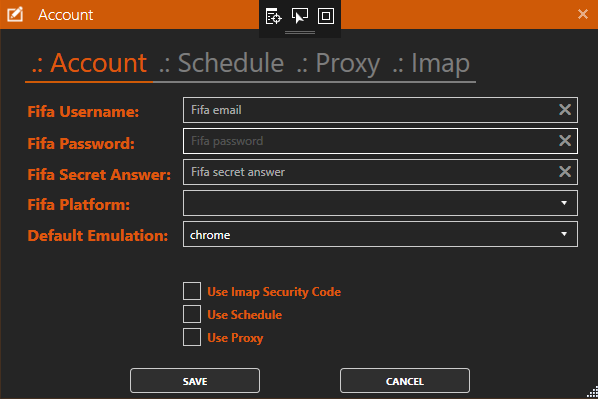 Process Max: Specifies the maximum number of items which can be processed at the same time. Setting this to 6 would mean that the total number of this item in Auction and Trade will not be greater than 6. Max Buy Items: Indicates the maximum number of an item to buy. Setting this to 0 means there is no limit, setting it to -1 means there will be no purchases. Max Sell Items: Indicates the maximum number of an item to sell. Setting this to 0 means there is no limit, setting it to -1 means there will be no sales. Price Method: Indicates which algorithm to use to determine buy/sell prices. The available options are Steps and Manual. Buy Price Limit: This will set a limit on the highest price it will buy. If an item updates to above this price the bot will still not purchase it. Setting this to 0 disables it. BN Times Over Bid: This selects how many steps above the bid price to set the Buy it Now price when selling an item. 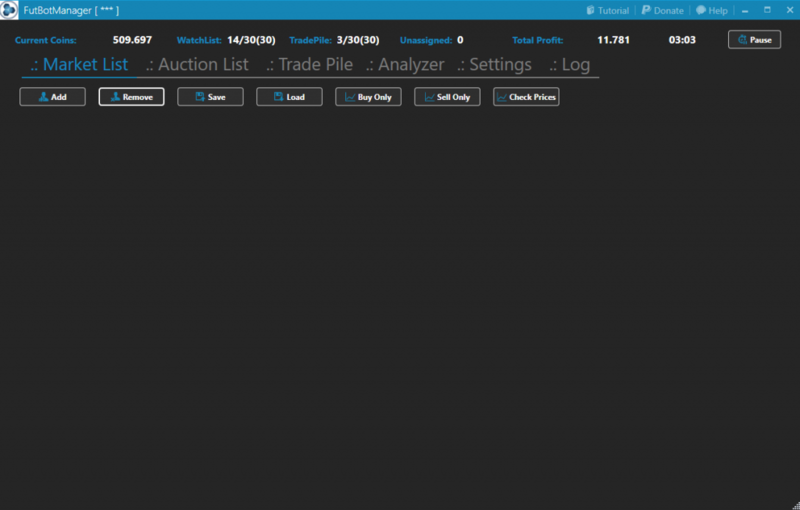 BuyNowOnly: This bot usually bid and bin at same time, but with consumables can be more profittable use only BIN mode instead bidding items, without wasting time with auctions. 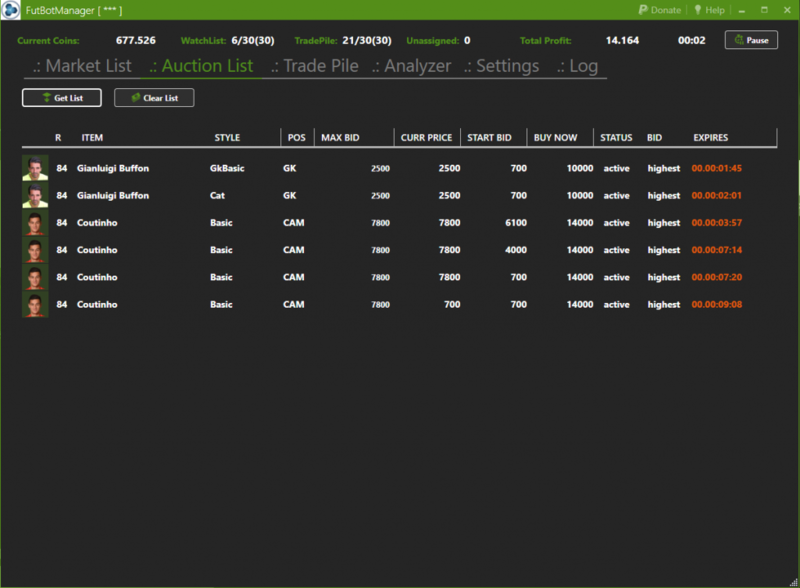 Bid Sniping: In this mode instead to make incremental bidding it will place a bid with same price of your buy price: example your buy price is 2000, it found a auction with 1600 instead of bidding 1700, then somebody put a new bid and bot rebidding 1800, it will place 2000 without waste time. Why we need do that, and why we need to waste our profit? Because some cheap items there are so many autobuyer then you waste your time to rebid and also make a lot of request, and then go into auction stuck. This is userfull with cheap items. Switch to Bin: usually if there aren’t any auctions with time left less than your “max expire auctions ” bot not make another search until it will be hit the nearest auction expire time left, with this mode enable instead waiting nearest expire time before make another search it will be switch into BIN search and make more search according your “next item search”. 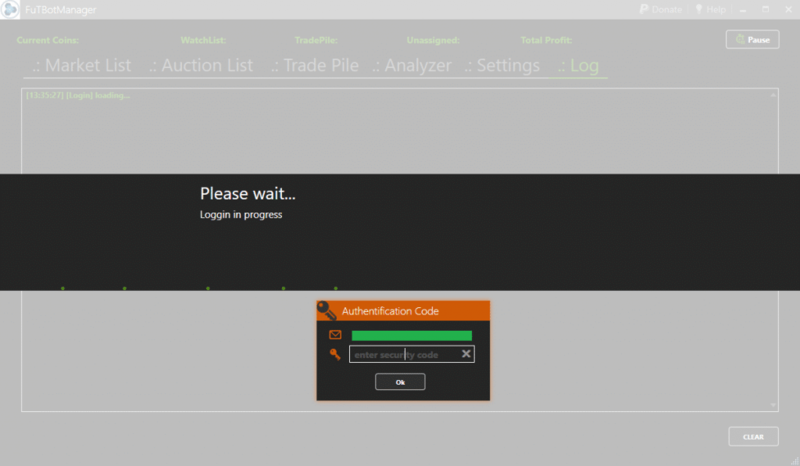 Example i setup “max expire auction” 10, it found the nearest auctions time left with 45m, usually bot not try to find a new search until we are around 15-20m expire of nearest auction, with this mode it will be try to search every “next items check” time with BIN mode, instead waiting nearest auction expire. 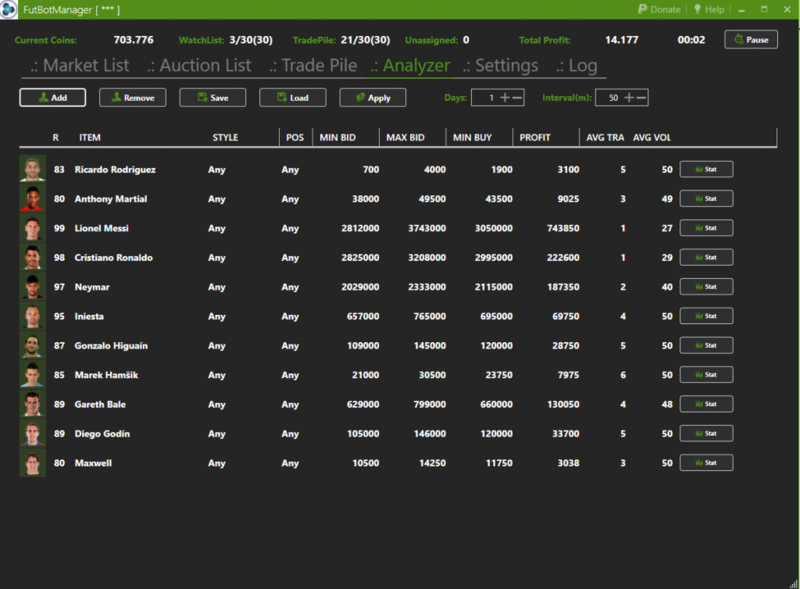 Skip if lost L/S: this is a very userfull tool, bot checking ratio for Auctions Lost / Searched, if ratio it is more than your setup, it will put items into SKIP mode, then it don’t waste time with items that you can’t win and you will make less request and bot will focus on more profittable items. This save times with big items list. While the Skip buttons are still checked the bot will only show the prices and not bid on anything. The prices will update slowly in order to avoid getting Banned. Once you are satisfied with the prices and settings you can uncheck the Skip button and the bot will begin buying items. The Edit button can be used to change any choices. 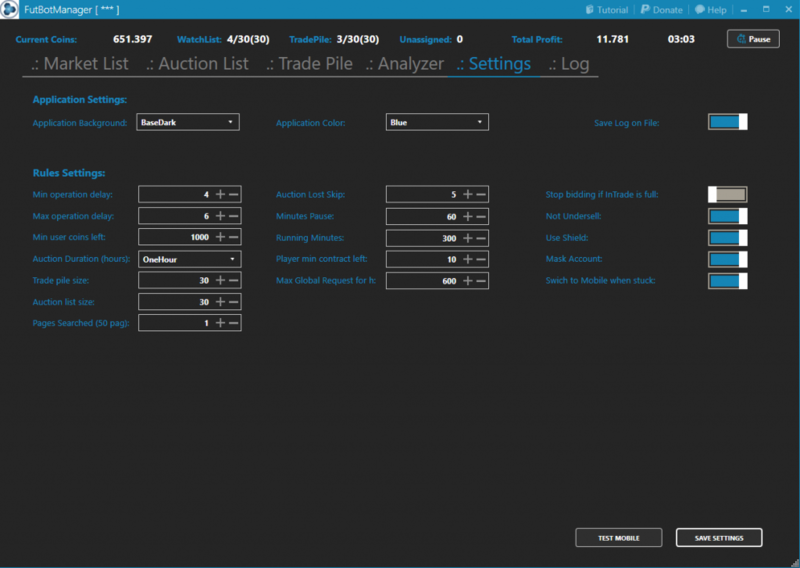 Using the Ultimate Team Stat button will show you market trends, however it will need some time to analyze the large number of auctions available. This will provide you with more reliable results. 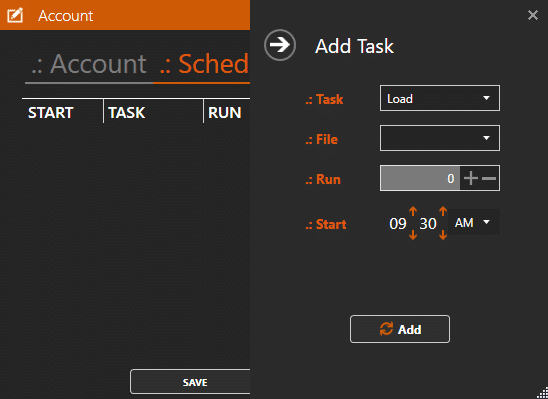 Once you’ve created a list you can save it, and later load it, using the appropriate menu buttons Save/Load. 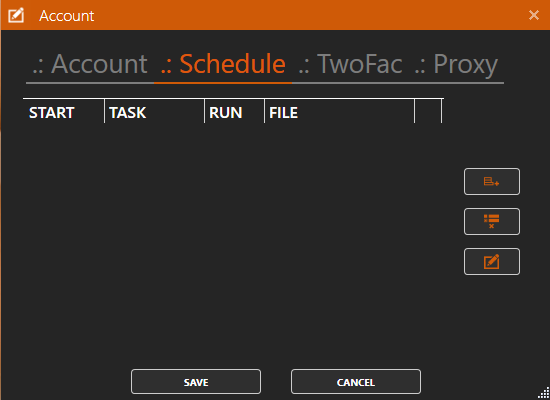 This is necessary to use the scheduler. There are also buttons to set the bot to only buy or sell items. This could be useful at certain times of the day. The Auction List/Trade Pile show the current status of their respective lists. The menu choices in these sections are not normally used except for advanced purposes. These will be covered in a later tutorial. Any items which are not displayed under these headings will be moved to the Unassigned tab. This will only be displayed when necessary. 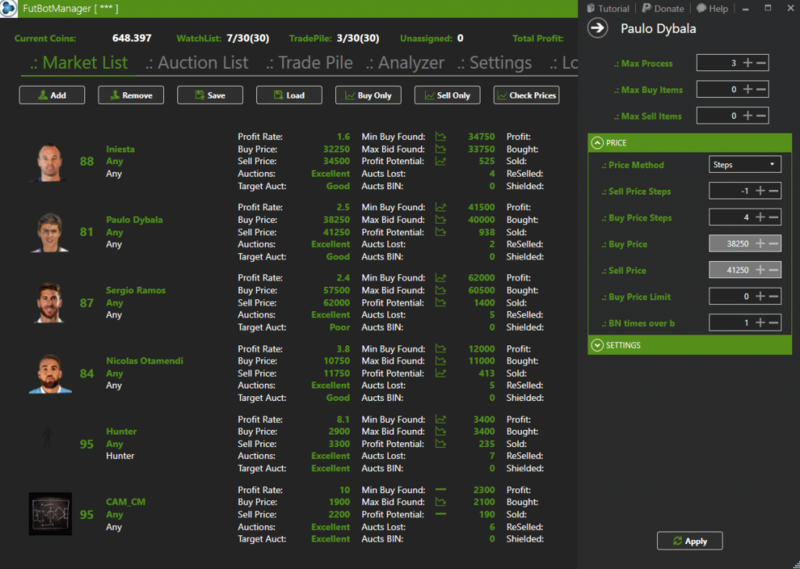 The Market Analyzer allows you to discover the best items in Ultimate Team to invest your coins into. Items can be added to this list in the same way we described earlier in the tutorial. This list can also be saved and loaded using the appropriate buttons. We recommend waiting 1-3 days before you invest in an item because the price can change dramatically over time. The volume of auctions and the number actually concluded are also important. We recommend carefully analyzing the graphs which can be fund via the Stat button. The Interval field sets the time in minutes between scans. The Days field is used to broaden or narrow the range of time for the data in the table, and does not affect the charts. After making any changes press the Apply button to apply them. Users can change the colors of the application. This is very useful when dealing with multiple accounts and helps to make them instantly recognizable. Most other settings have a limited range for security purposes. This helps the user avoid bans and other errors. Pay close attention when changing any default values. We highly recommend not making any changes to the Page Searched value. We also recommend not lowering the values in the Min Delay operation. 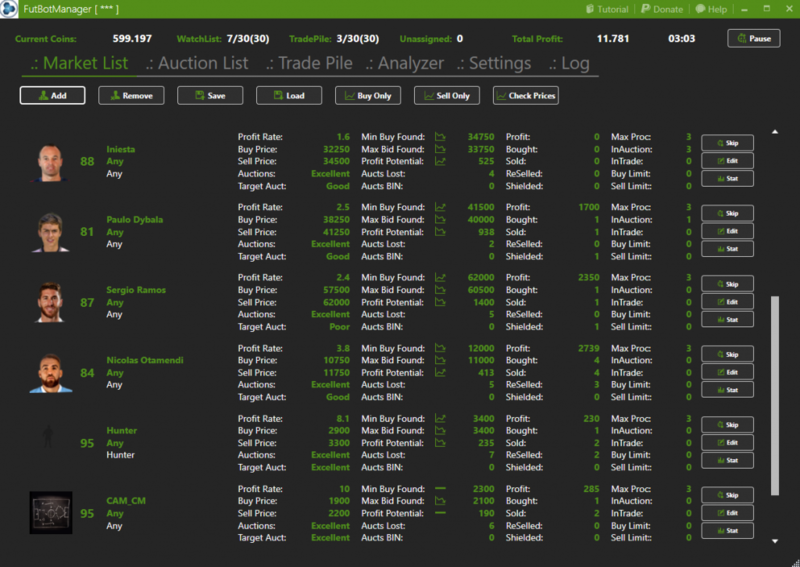 The analyzer works best with a maximum of 20 or 30 items, while the ideal market list has no more than 10 different items. For proof look at the profit chart on the left. This was made with a single account using a Threshold of 100. We used 15 different items and only ran the program for 8 hours per day. 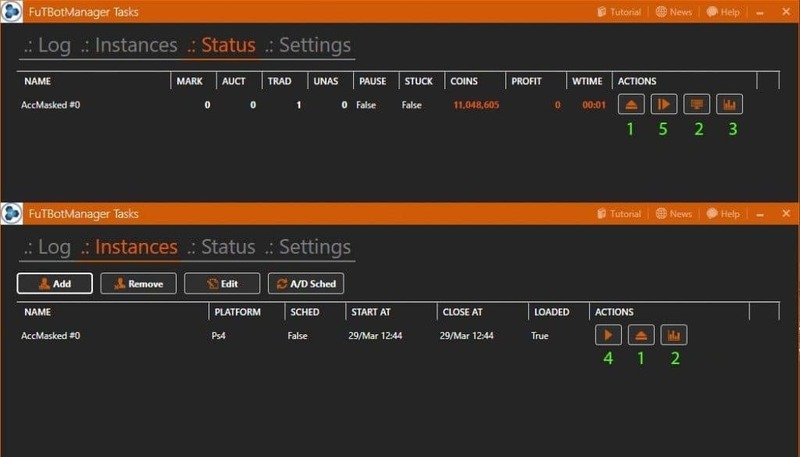 Don’t forget to check NEWS area where you can find tips or articles about bot usage.